Another eight days until my plaster comes off, and yet I am still not getting a full night's sleep as I keep waking up in pain after intense dreams about my feet and kicking myself awake. The cat is very worried and comes and purrs and dribbles in my face. Or, he might be hungry and thinking I'm awake so that means breakfast time now. Who knows the minds of cats...? I have only managed to get to the pub once since last blog and I only had my walker when I got there so had to climb over the steps. OH arrived with my crutches to get me back out of the building with more dignity. Well, I say more dignity, if you can have any after midnight when you've been on the Thatchers and only have one leg. Besides this, we had a boozy couple of cans-at-home days the week before, but generally much less in the way of alcohol than the early days of gloom, so I am hopeful that the expanding belly has not expanded as much as I'd feared. I can still get in my grey combats anyway. Plus, witness me on a friend's telly yesterday, looking kind of like a small child*! On a snowy day, I made my way to Northampton College to take part in a debate about Northampton County Council being slammed in Max Caller's "Best Value" Report. I was there representing library campaigners, and I was really concerned that libraries only got mentioned once in the report once, and it seemed to be to blame NCC for not getting rid of library staff already to save the money. This makes me really worried that when the commissioners come in a poo situation will become one of such deep guano, it will be visible from space and we find more penguins in it. Not Penguin books, either. As I nearly brained myself getting there (falling over on the ice as soon as I got off my front step, and slipping several times on the path up to the college), I was a bit miffed to be told I was question 4, and they only got up to question 3. 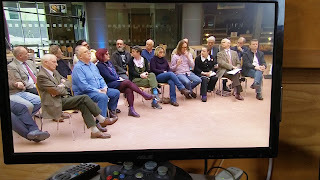 So, yet another political debate programme next to my long-haired husband, where we have smised, looked miserable, and not got to speak (we are Northampton's Posh and Becks of politics). Of course, I had to be sitting next to Jim Harker, former head of NCC until 2015 whose fault the mess most definitely mostly is, but no torches can reach him like they could Heather Smith. He seems a nice enough fella, but my goodness, does he seem blithe or what? I think what the report does seem to indicate is a lack of strong management, but is riddled with p-taking statements like "In Local Government there is no substitute for doing boring really well." Things like that are hilarious, but not really very helpful. I agree with Gareth Eales speaking in the programme yesterday, that services will need transitional funding, not just some vague statement within about "This may require some transitional funding to ensure the effective establishment of the new authorities and also the postponement of any local elections due in May 2019." What, does that just cover the cost of elections? Whoop-de-doo. Unless the commissioners can come in and help run the services as they should, and not just make things worse, then what is the point? So, what the report doesn't do is wave a magic wand over the incredible cheek of the March 13th cabinet notes and make them go away. Community groups have now been offered a range of packages to take over their closing libraries from bronze to platinum, and they are so crappy. Bronze is 500 books for £6K for 1 year. Silver is the same for £6.5K but shelf-ready. No idea what you are getting either, all blind. Gold, you have to buy silver package first, then can start adding on the NCC library management system (1 scanner, 1 terminal, system support - but read on - catalogue and manual) for £3.5K per year, plus £1.75K set up costs, and then you need to pay an annual charge of £600 for telephone/email support. You must buy Gold and Silver to then buy Platinum bolt-ons inclusing a self-service terminal at £650 per year, a training session on how to use the stuff at £500 for a 6.5 hour day, participation in schemes like Bookstart and national reading challenge charged at (mystery) cost. Plus if you need on-site help after, that's £100 per hour plus travel expenses please! Of course, you could just go your own way. And at these prices, that's what many are planning from what I've heard. Totally manual, uncomputerised systems, sourcing their own book stock, hoping the volunteers keep coming and users too. And they'll be spending a fortune on leases and running costs. I've heard some are taking out special loans for the village to pay back. I mean, that's... wow. Might as well shove your old Martina Coles in a telephone box, call it a library and save yourself the heartache. I think many such things also have defibrillators in them, which is not only very useful, but handy if you suddenly go into cardiac arrest at the realisation that this is kind of the best some places can manage. My heart is utterly broken. Still, we keep campaigning and fighting for our libraries. After leaving filming, I went to The Lab to run a comedy creative writing workshop, and had a lovely Sunday lunch and a great time with the Arts Lab crew. It started snowing again then. Even though the Lab has ramps for easier access to the pavement, getting out over the ice was traumatic, and it took 4 people to get me to the car. I had decided to let the ice melt a bit before venturing out today as my little walker brakes can only do so much and I don't have help getting from the station to the office. Means I've had to take it as holiday, but what can I do? Can't wait until I'm a bit more mobile again. Just worried about the pain now. Hope the leg's better soon. So 1 union rep from the audience spoke. 1 labour panel member, 3 tory panel members. Vast majority of audience speakers was tories.